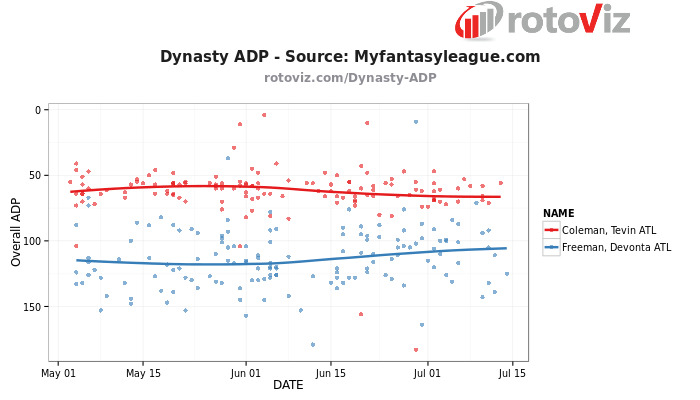 Devonta Freeman was one of the most polarizing and disappointing running back prospects of 2014. In 2015, Steven Jackson retired and Freeman rose to the top of the Atlanta Falcons’ depth chart. A few months later, Tevin Coleman — an even more polarizing running back, stepped onto the tarmac of Atlanta’s Hartsfield-Jackson airport. Coleman vs. Freeman is sure to be one of the highest profile training camp battles of the summer. Anecdotal tidbits from Flowery Branch, GA. will be gracing our Twitter timelines daily as fantasy sports webpages update us on the perceived “winner” of the starting running back position for the Atlanta Falcons in 2015. Take a glance below at the dynasty and redraft average draft position (ADP) graphs with the snapshot beginning from day one of the 2015 NFL Draft. I foresee some hijinks in the upcoming month in regards to fantasy player perception of this RB competition. In this article, I would like to examine the two combatants and their physical profiles using the information that can be handily found on RotoViz.com and PlayerProfiler.com and what it might mean for their roles on the Falcons and your fantasy team for the upcoming football season. In one corner, hailing from Florida State University, at 5 foot, 8 inches, weighing in at 206 pounds. Devonta Freeman. Devonta is entering his second season in the NFL. He was drafted by the Falcons in the fourth round of the 2014 NFL Draft. In his rookie season, Devonta shared time with Jacquizz Rodgers as the backup/change of pace back to longtime NFL veteran Steven Jackson. Somewhat surprisingly, the 31 year old Jackson played 15 straight games before sitting out the final week of the season. Freeman received sporadic carries throughout his rookie season and never really established himself as the 5.9 yards per carry back he was at Florida State. Some of the blame can be placed on the offensive line. Pro Football Focus ranked the o-line 26th in the NFL and 29th in run blocking. PFF did note that the line began to mesh and improve near the end of the 2014 season. It will be interesting to see if the new zone blocking scheme will drastically improve their performance in 2015. Devonta Freeman has below average workout metrics across the board. He wasn’t particularly productive compared to the Florida State offense as a whole (17.8 percent College Dominator, 19th percentile) which has produced five NFL offensive lineman in the last three years. One area Freeman was productive for the Falcons last year was in the passing game. After Matt Ryan was sacked a career high 44 times in 2013, they trusted the rookie enough in pass protection to aid the porous offensive line while averaging a 21.8 percent snap share last year. Matt Ryan was only sacked 31 times in 2014. With a 78.9 percent catch rate, Devonta turned 38 targets into 30 catches for 225 yards. A very respectable 7.5 yards per reception with an average 6.1 yards after the catch. 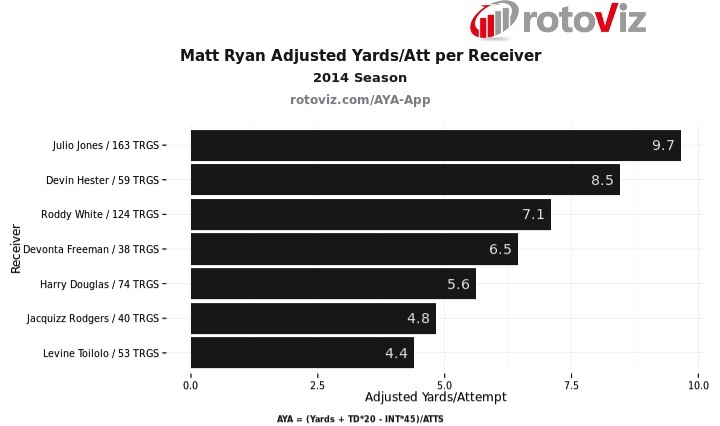 The graph above points out that Freeman was Matt Ryan’s fourth best pass option in terms of productivity in 2014. In the opposite corner, the rookie from Indiana University, at 5 foot, 11 inches, weighing 206 pounds. Tevin Coleman. Tevin was drafted by the Falcons in the third round of the 2015 NFL Draft. Following the 2014 season, Head Coach Mike Smith and staff were fired. Seattle Seahawks Defensive Coordinator Dan Quinn was hired as the head coach and brought in Kyle Shanahan to run the Falcons offense. This is the point where I am obligated to mention that draft position matters. The same front office drafted both players but it would be naive to ignore the round each of these players were drafted or that the new HC and OC had nothing to do with the selection of their third round draft pick. If we look at Tevin Coleman’s workout metrics, we see he has elite speed for an NFL running back (89th percentile) after running an adjusted 4.39 40 yard dash at his pro day. With 22 bench reps he has above average strength which makes his BMI less of a concern in regards to pass blocking. We don’t have burst or agility scores for Coleman. He did not participate in those drills at the NFL Combine or at his pro day because he was still recovering from offseason surgery to repair his broken foot. A foot which he broke at some point during the Week 5 North Texas game. The following week he ran for 219 on 15 carries and 3 touchdowns against Iowa. 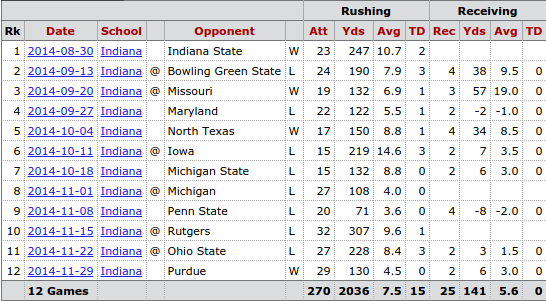 Tevin Coleman was the offense for Indiana in 2014. He had an absurd 43.2 percent College Dominator Rating (90th percentile) and 7.5 yards per carry (97th percentile). He is one of only 24 NCAA running backs since 1956 to rush for over 2000 yards in a season. His NFL draft scouting report notes lack of vision and patience, and the inability to break tackles. It was from this film analysis that the notion “Tevin Coleman is not a fit for the new Falcons zone blocking scheme” was born. As a counterpoint, he was the Hoosiers offense as evidenced by his College Dominator rating. When a running back is behind a below average offensive line and the defense knows who will be getting the ball. The running back has no choice but to run to the hole the running play was designed for and hope that it’s open when he gets there. Watch the Draft Breakdown video on his player page. When the hole was there, he took it to the house. Like many positional battles with fantasy implications, there is a common belief that the outcome is purely digital, black and white, with no in between. I don’t believe this is one of those situations. I believe that Tevin Coleman will more than likely lead the Atlanta Falcons in carries this season. However, I also see a role for Devonta Freeman. He’s a good pass blocker and an excellent receiver out of the backfield. That will keep him on the field in many game situations. I foresee this season playing out very similar to what happened with the 2010 Kansas City Chiefs. It was very obvious that Jamaal Charles was the best running back on the field but he was also extremely effective with 15-20 touches per game (6.4 yards per carry average). I can see Tevin Coleman playing the same role as his Best Comparable Player this season. 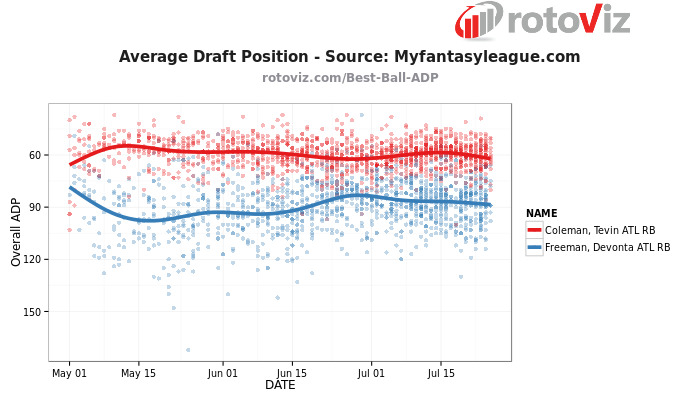 Coleman’s value has stayed fairly steady since the draft. There is a very real possibility that he may not be named the starter come the end of August. That may present a buying opportunity. My recommendation for dynasty startups and redraft leagues drafting before mid-August is to buy. There may be a dip in value when September comes around but I would gladly pay for the best RB on an NFL roster when he’s still available 5th or 6th round. At the same time, should he win the job in training camp, his value is surely going to propel him two or three rounds higher in drafts. I would also advocate buying Freeman at his current price. I think his role and efficiency in the passing game will provide a solid floor of fantasy points. In dynasty leagues, you may get a chance to flip him for value if he is named the starter right before the season. Aaron Butler is an unapologetic New England Patriots fan and a contributor for RotoViz and PlayerProfiler.